Action-horror author Thom Carnell brings you such thrillers as No Flesh Shall Be Spared and Carpe Noctem. In this collection of short stories by Carpe Noctem publisher, Fangoria/Dread Central contributor, and No Flesh Shall Be Spared author, Thom Carnell, we present seventeen stories of the otherworldly, seventeen tales of the supernatural designed to chill, consternate, and entertain you. 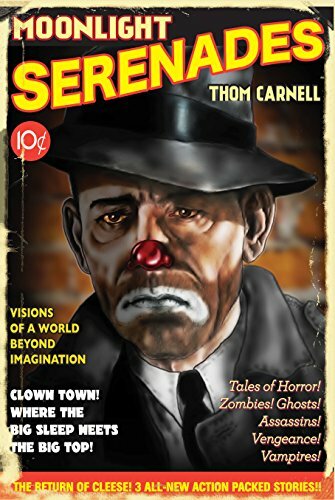 From returning heroes (three stories feature Cleese, the iconic hero of No Flesh Shall Be Spared), mountain ghosts, zombies, and vampires on the hunt to a world where social stature is determined by what kind of clown you are, MOONLIGHT SERENADES heralds Thom Carnell’s triumphant return to fiction writing. Once in a while a horror writer comes around who makes you sigh a deep breath of fresh air at his or her witty charm and original ideas, and Thom Carnell is one of them. In this collection of short stories of the otherworldly, we get seventeen supernatural tales designed to chill and entertain. From returning heroes (three stories feature Cleese, the iconic hero of No Flesh Shall Be Spared), mountain ghosts, zombies, and vampires on the hunt to a world where social stature is determined by what kind of clown you are, there’s a little bit of everything here. Moonlight Serenades is such a beautiful and well written book of short stories, some of them poetic as Edgar Allan Poe or even Walt Whitman. From the first story, “Wedding Day,” I was ultimately enthralled and looked forward to the next one as I moved on. I enjoyed every story as much as the first and especially loved how Thom gave a bit of insight into the reasons why he wrote each one and even what influenced him to write it. Thom makes you actually feel what he must have been feeling while writing these stories. The amount of pain or happiness that he puts in to every word, or whatever the emotion, isn’t spared at all. You can actually imagine in your own mind the beauty of each of these stories in depth to your soul. Each story takes you to a different place for an entertaining and wild ride for your imagination to indulge. This book is a must-have, and not just to read once, but to read over and over again. I highly recommend it to everyone, and not just to the horror community. It’s perfect for anyone looking for something different that will take you places in your mind you’ve never been before. Moonlight Serenades, Thom Carnell’s collection of seventeen short stories, is pretty incredible. I had to take a step back from the book a few times just to be able to savor some of the tales. In “Wedding Day”, a man in mourning proceeds with what is to be one of the best days of his life, in a very different way. “Another One for the Fire” is a retelling of the opening scene of Night of the Living Dead through the perceptions of the character of Barbara, and is quite beautiful. “I Stand Alone” is written in screenplay format, from the point of view of, seemingly, the last man on Earth, watching the world from his window, and venturing out only to collect supplies. But things are not as they seem in this black and white world. “Canto Carnascialesco” is the story of Billy and Elena, two teenagers on their first date at the carnival. Unfortunately for them, and all of the other carnival goers, things turn into a bloody mess. “Retribution” is an incredible revenge story told in first person. The question I think the author poses here is, how far would you go to avenge, or revenge, the death of your child? Carnell also includes three stories about Cleese, the hero of his previous book, No Flesh Shall Be Spared. Two other stories really sat with me. “When I Fall in Love…It Will Be Forever” actually made me cry. Gene and Dottie are trapped in their basement after their home is overrun by zombies. Unfortunately, Dottie did not come away unscathed, and has turned. Gene is doing his best to feed and care for her, while keeping himself safe, but he misses his wife, especially after he flips through one of their photo albums. After contemplating life without her, he makes a life-changing decision. I wasn’t too sure about “Clown Town” when I started reading, but it turned out to be my favorite in this collection. The story revolves around the “moidah” of a member of the Harlequin family. Carnell uses 1940s jazz and circus slang in this mystery story, which follows Detective Bumbo and Inspector Garbo as they investigate the scene in Marceau’s club and question the suspects. There’s even a little bit of intrigue, and a love story between Bumpo and Josephine, an employee at Marceau’s. I found it interesting how Carnell writes the various types of clowns, by dividing them into cadres or gangs. The story reads very much like the old time radio shows of the 1940’s, and I couldn’t help hearing the voices of Philip Marlowe or Sergeant Joe Friday in my head as I read this story. I hated to reach the end, not because of the conclusion itself, but because I want to read more about this world. I kind of fell in love with the world of these clowns. The other stories in this collection are just as powerful as the ones mentioned above. Recommended, especially for readers who are drawn to stories that make them sit back for a few moments before starting on another. It’s been a week or so since I read this collection, and there are still tales that I think back on, and have revisited. Thom Carnell's MOONLIGHT SERENADES is a delight for those readers who have read as many zombie books as possible and a pleasure for those who've read all those books and are ready for something more. What you get here includes more of Carnell's Cleese from his novel NO FLESH SHALL BE SPARED. If that is all you come for, you'll get your money's worth. But there is so much more. Reading "Clown Town" is a lesson in how mythologies get built around archetypes. Clowns, jazz and the neo-noir setting that contains them both all make the story so much more than what you might assume from the title. And yet, like the title of the collection, it is perfect. The story is musical, too. It has beats and breakdowns. It has sections that feel like improvisation. The secret to jazz--and the secret to this story--is that the first time you read, you think a crazy man just made all this stuff up on the spot. But if you read (and listen) carefully, you'll notice how each note/word perfectly follows and leads into the next. Successful improvisation takes practice. This style of music reflects the action in Carnell's work. He knows what it feels like to punch and be punched. Far too many action-oriented writers don't know this feeling. When a Carnell character comes away with a bruise, there is a good chance Carnell himself has had a bruise there. Let us not, however, assume Carnell is all about kicking and punching or stick and knives. MOONLIGHT SERENADES has a wealth of beauty, too. "When I Fall in Love ... It Will Be Forever" deserves a place in the canon of zombie literature. It is, hands-down, the best zombie story you will read this year and next year. If it is the last zombie story you ever read, you will go out on the highest note possible. The Schwarzenegger film MAGGIE tried to touch the same emotional buttons but does not do it as well as Carnell does here. I would be remiss if I did not mention that there is beauty in the disgusting, as well. "Tales from the Crypt" is being revived and if they don't contact Carnell about rights for his story "Amplexus," they are missing out. This collection is a guided tour through one man's process of dealing with grief, and in that tour, some of the images he uses will stay with you for weeks. From the opening story, which left me audibly exclaiming in public, to the centerpiece, a very clever noir called "Clown Town," Thom Carnell's Moonlight Serenades is incredibly addicting, and sticks with you like a great meal. Highly recommended.